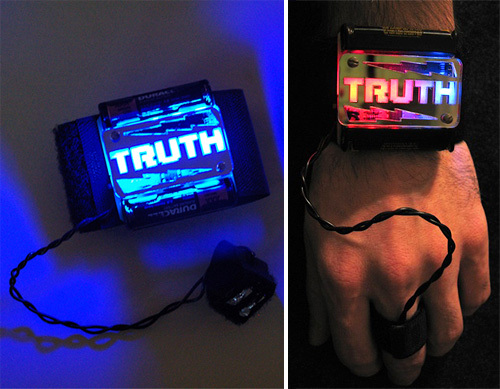 Truth Wristband Kit | OhGizmo! If you were hoping to catch someone in a lie, this less-than-subtle truth detecting wristband probably isn’t the best tool for the job. But if you’ve always wondered if you could beat a lie detector, for just $44.95 from Maker SHED you can order one of these Truth Wristband Kits which comes with everything you need including an etched PCB, a finger strap with sterling silver plates and even that fancy laser-cut TRUTH face plate. The wristband simply measures your skin’s galvanic response to ‘evocative’ questions, and turns from blue to red as the victim becomes emotionally aroused, revealing their true response to the question. A great tool to beat a liar. I prefer something a little heavier and easy to swing like a nine iron. this somes very interesting, but does it is something scientific ? there are many kinds of beautiful and powerful consumer electronics that I like it very much! you can wholesale from there with Better Products and Better Prices!